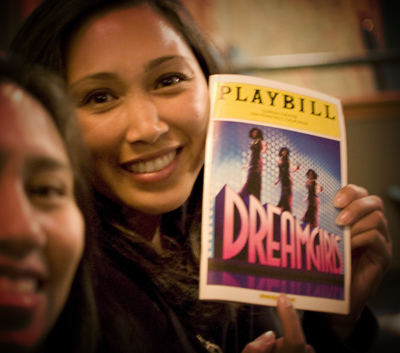 Home » My Homestead » Everyday Adventures » We Are Dreamgirls! 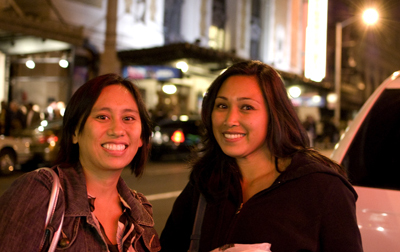 The other night I went with my friends, Leilani and Christine, to see the “Dreamgirls” musical in San Francisco. I’m going to admit, I wasn’t the biggest fan of the movie. 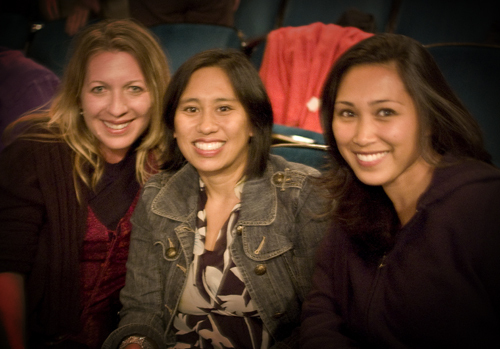 Don’t get me wrong, the singing was fabulous and Jennifer Hudson and Beyonce were AMAZING, but my two friends, well, they were IN to the movie – as in they’ve watched it about a bazillion times. I’m definitely not one to pass up heading to the city for an evening. We had big ideas about where we would eat dinner. 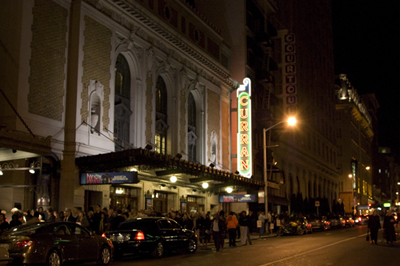 In fact, Christine was kind enough to look up vegan restaurant choices near the theater, but as luck and traffic would have it, we didn’t really have much time before the start of the show. 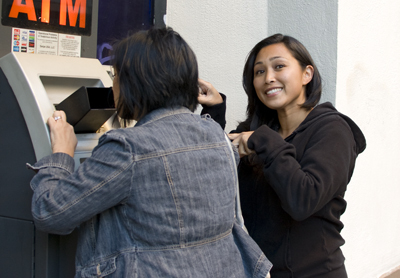 So, we found a parking garage close to the theatre (with a great flat rate), stopped at an ATM and headed out to find a spot to grab a bite. We spotted Max’s Diner across the street. Both Christine and I had eaten at a Max’s before, but this was a first for Leilani. Leilani & Christine ready to chow down! 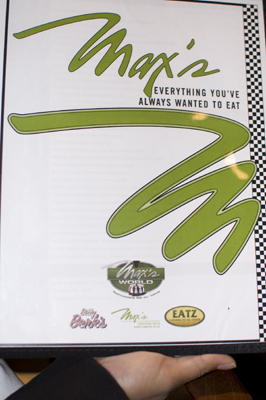 Have you ever eaten at a Max’s Diner? They have just about anything you could want to order on this menu. Trust me, though, try to share something. All their servings are huge and nearly impossible for one person to finish. All three of us are petite (under 5’3″), so there was no way finishing an entree alone was going to happen. 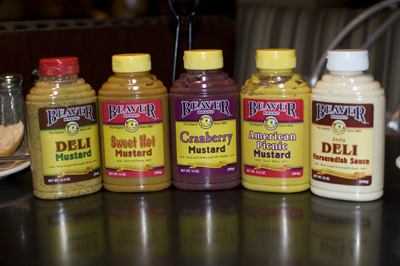 We thought it was super cool that they had all these mustards available on the table, so I had to take a photo. I know we’re geeks! The even “geekier” thing is that I took a photo of mustards but not of their fabulous desserts! They were huge and it would just be awful for you to see them and not have any anyways so you can thank me later for saving you the torture. Even though it’s not a “vegan” spot, I was able to get a BLT minus the B(acon) and add the A(vocado) on grilled sourdough – it is San Francisco afterall so sourdough is a must. The service was quick, the food tasty and we were off to our show seats in plenty of time. Plus the theater was just across the street. 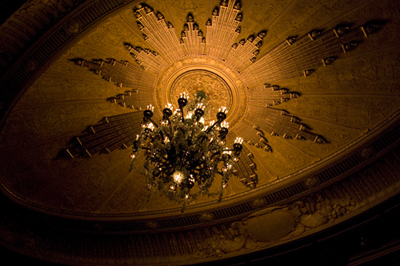 Of course, I couldn’t take photos during the show, but I did get this shot of the theater’s ceiling – it is so beautiful. The show was really good. The singing was amazing, the costumes and gowns divine and, trust me, you have never seen so many fabulous wigs! I really don’t know how the actresses change so quickly over and over again. I would recommend seeing it. 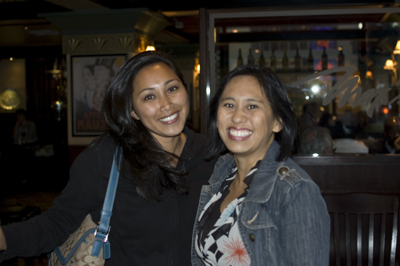 And, just like with the movie, Leilani and Christine are ready to go and watch the show again – about a bazillion times! Happy, happy post show girls! an ALT sounds pretty good right about now– especially that sourdough! 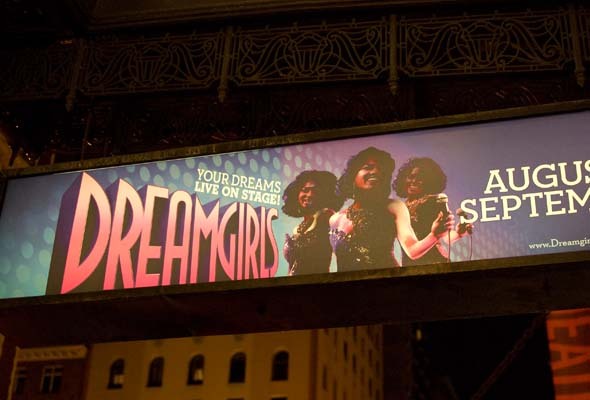 that theatre looks so glamorous. i hope you enjoyed the show! Thanks for driving Jen and for blogging about the night. Next time we’ll leave super early and get some good vegan eats! !